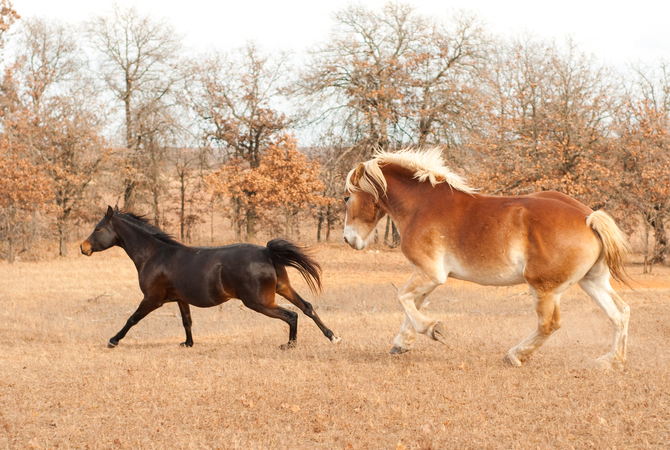 Two horses running in pasture during turnout. Physical activity is crucial to a horse's well-being. Horses have 216 individual bones held together by ligaments and surrounded by muscles. Because the horse is such an athletic animal, keeping those bones, ligaments and muscles toned and in good working order through exercise builds stamina, endurance and resistance to disease. A wild horse will travel 30 miles in a 24 hour period as it grazes, drinks, and sleeps standing on its feet. Daily exercise facilitates bone strength and development, improves the functioning of the heart, increases tendon and ligament strength an aids motility of the digestive tract, as well as increasing secretions in the lungs. At low levels, exercise improves the immune system and essentially keeps the horse's body in good working order. Young horses are especially at risk if they are stabled most of the time. Orthopedic disease and malformations of the limbs, bones, joints and feet because of a lack of exercise lead to lameness and other problems that affect the soundness of the horse. In addition, the horse's mental state is affected and behavioral problems related to pent-up energy and associated with confinement develop. When you do try to ride or exercise the horse, it may respond by bucking or kicking. Cribbing, stall walking, weaving, wind sucking and other vices or stereotypies may become part of the horse's personality due to confinement and lack of exercise. What kinds of exercises work best? If your horse is getting plenty of exercise, good for you! If not, you will need to ease into an exercise routine beginning with light exercise such as walking, exercising the horse on a rope, or longeing the horse, being careful not to put too much stress on the horse's legs. For most horses, riding is the best exercise. If the horse is pastured and free to move about, it will need less work-out time. Like humans, horses like a varied exercise routine, so vary the route for your rides and trot up and down hills or over varied, but safe terrain when possible. Once your horse is accustomed to daily physical activity, you can up the pace with riding at a trot and cantering for longer distances. Gradually increase both the length of the exercise and the amount of work required of the horse. Trainers estimate that it takes eight to ten weeks of regular exercise for one to two hours a day to get your horse reasonably fit. If at all possible, allow your horse free exercise time in a pasture or paddock. Horses can work out the kinks when they have enough room to run, stop, turn, kick up the heels and just be horses. If you cannot exercise your horse on a daily basis, you might want to hire someone who can exercise the horse for you. Be sure that the person is fully acquainted with the horse and with the exercise program you want carried out. Another way to provide exercise for horses is with a hot or mechanical walker which is an automatic device built like a merry-go-round that the horse can be hooked up to for exercise. Many boarding stables have hot walkers, so if your horse is being boarded you can ask them to hook your horse up to it on the days you can't exercise it. If you can afford a hot walker of your own, you can be doing other things while the horse is being exercised. Just make sure you are alert in case the horse tires too much or something goes wrong with the walker. Irregular exercise predisposes horses to "tying up" also known as exertional myopathy with azoturia being the more severe form. It is also known as "Monday morning disease" because it often occurs when a horse has rested, been fed a working ration, and not had sufficient exercise over a weekend. The horse is then stiff and sore on when returning to activity on Monday morning. Most horses tend to get either too little or too much exercise. That is because they are dependent on us and cannot make their own determination about when to start and stop. Lucky is the horse that has a large pasture in which to run and play and graze for much of the day. Unfortunately most horses don't have this luxury, and even when they do, they need some supervision, especially if other horses are in the pasture to make sure they don't become injured. Most trainers and horse experts maintain that a horse's daily exercise or work should be sufficient to cause the horse's pulse, respiration, and perspiration output to increase to the point that they are noticeable. Once that point is reached, the horse has had enough exercise for its physical condition and should be allowed to cool down. An older horse in training is going to need time to warm up, so taking time for walking before going on to more demanding exercise is important. The question of how much exercise is too much or too little is a subject of research by horse physiologists. A generaly accepted technique for understanding a particular horse's fitness level is by measurement of heart beat recovery rate.